It took a very long time for the Statue of Liberty to find a home on Liberty Island. In fact, for several years, her creators showed off pieces of her body in NYC and Philadelphia in an effort to drum up funds to finance the statue's completion. 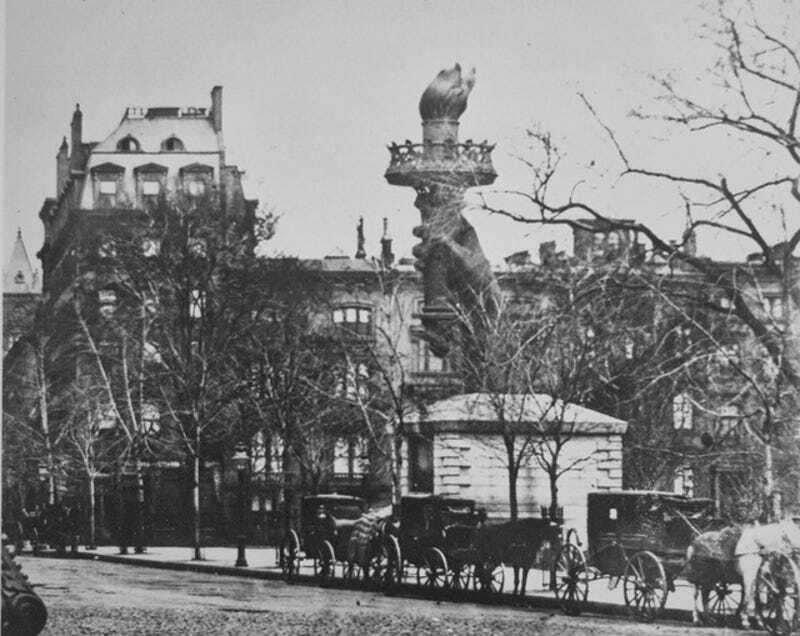 The picture above is from New York City's Madison Square Park, where her arm lived from 1876 to 1882. Designer Eugène Emmanuel Viollet-le-Duc—who would have been 200 years old today as Bowery Boys points out—was the original designer of the skeleton of the iconic statue, and the teacher of Frédéric Bartholdi, who designed the actual lady. Both men traveled the East Coast hocking her half-complete shape in front of crowds to raise the money they needed to finish her—but unfortunately, Viollet-le-Duc never saw Lady Liberty completed. He died in 1879, almost a decade before his statue was installed on Liberty Island in 1886.